I am sitting down to a small after dinner decaf coffee in the bunny mug my daughter gave me for Christmas. It's on the small size and I love the pictures on it. I saw many of these types of bunnies on prints and cups and other items when we visited England two years ago and was so tempted to buy something at the time. I adore anything with a rabbit on it. What's even better is if the rabbit is wearing a little coat, or holding an umbrella, or having a moment with a mouse who is also wearing clothes. Anthropomorphism is the applying of human qualities to things that aren't human, such as sweet little woodland creatures. 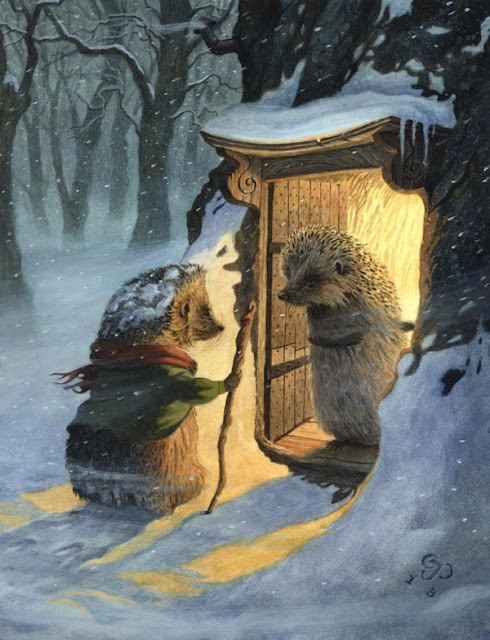 When I see illustrations that show darling, furry animals in their cozy little homes drinking tea and reading the paper, I feel warm and happy. These all make me smile. Such detail in those pictures...so charming. The detail is important. There are illustrations that do not have the same kind of detail and they don't appeal to me as much. Hedgehogs are great because even though they are prickly, they can be made to look darling. Hi Martha! You are an animal lover, so no surprise. Your choices are so right up my alley and that rabbit on your mug is adorable! 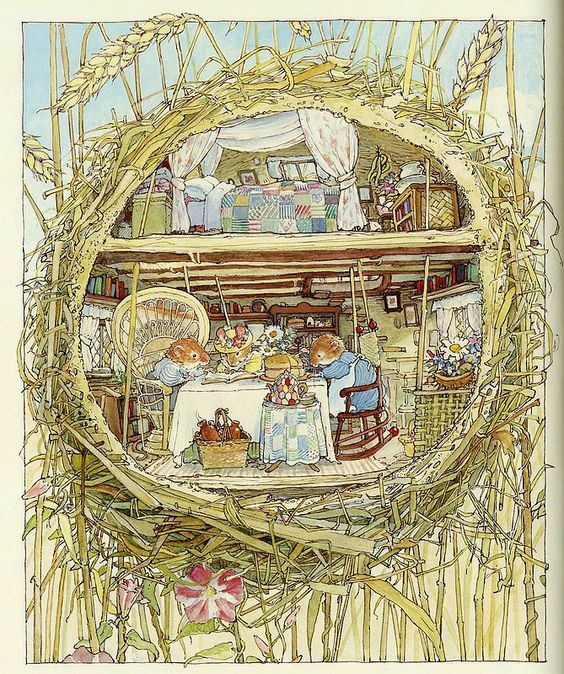 I have a great fondness for whimsy and anthropomorphistic illustrations in books, especially the interiors of their houses, for some reason. Make it underground or a treehouse and I'm moving right in! Even the simple b&w line drawings in "The Wind in the Willow" and "House at Pooh Corner" can have me fixated. But you're right, the more detail the better! 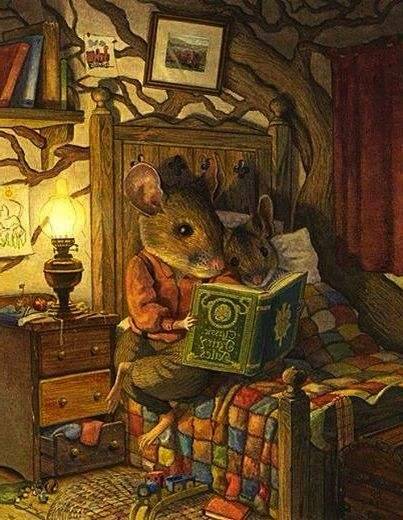 The interweb is full of fun stuff, like the blog of kid's book author/illustrator Maggie Rudy, MousesHouses. It's worth a peek! I love these, Jenn! I have all the Barklem books, the flower fairies (I know, they are a bit different, not small and furry!). I have all the Beatrix Potter books and my bedside table has a lot of this sort of little figurines. Maybe I should blog about it sometime! I have many books about children's book illustrators as well as a lot of illustrated childrens books. My son just had to fix one of my rabbits (though I suspect it is a hare) whose ear had broken off. He is all better now.......You saw my new tote bag on a blog post. You are such a kindred spirit! Flower fairies- my daughter had those books and we purchased a few figurines for her when she was young! I used to make rabbit dolls - Rosie Rabbit with her floral print dress and white pinafore, and Robbie Rabbit with his red felt coat and blue breeches! Do you still have any of them? I have some in a box in the attic, just in case I'm ever blessed with grandchildren. I love your Wrendale mug. I collect their pieces with the scruffy robin on them but all of the images are beautiful. I think I know what you mean, that robin is cute, too. I love a bit of anthropomorphism too. The Wind in the Willows, Rupert Bear etc. You would like the woodland creatures I made last year which were cast in bronze. They were for some wealthy (and lucky) grandchildren. Yes, I love Wind in the Willows, as well. Lucky grandchildren, indeed. The mug rabbit has got to be one of the cutest I’ve ever seen. A sweet moment. It feels good to hold, too. I'm with you! Sooooooooooo cute. That is very cool and I learned a new word ... Anthropomorphism - Neato! And ever so cute. Great mug too. There's just something about a mug that makes us happy when we use it or see it. I love that! Happy to introduce a new word! You must check out Wispy Willow Wanderings. My friend, who is the childrens librarian at our local library, brought the site to my attention. SO SWEET! This is one of the reasons I loved "Watership Down"! Oh, so funny. I used to sign that book out of my school library when I was little because I loved the cover. It was a bit too difficult for me at the time so I never read it. Wonderful pictures! Reminds me of a new book I just bought from Amazon It's called "Making Luna Lapin" and it is the sweetest book. It's a sewing book that has patterns for Luna the bunny, clothes for Luna and even a little overstuffed chair. If you sew, I think you would love it! I can't wait to get started on mine! I do sew, but haven't sewed for years! Beatrix Potter was a big part of our two kids' lives. When we had an outdoor cat it was SO hard to get a picture of my sweet little chipmunks. Then the outdoor cat grew old and passed on and the chipmunks multiplied and grew bold and came right up to the camera. Then they began tunneling in the wood retaining wall, and eating up the wood outdoor steps. So, I sold the house and I still love chipmunks. It's so easy to forgive a chipmunk. Squirrels? Different story. I'm a sucker for rabbits and all anthropomorphic illustrations so you can imagine how my heart is pitterpattering right now! 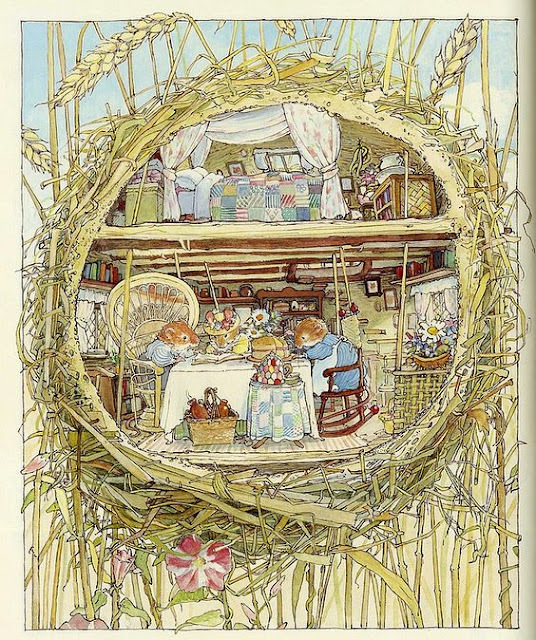 Beatrix Potter and Garth Williams and Tasha tudor and so many more were made for me. Cats and bunnies are my favorites. LOVE your mug to bits! Did you ever watch Wishbone, a kids show where a Jack Russell acted out great classic stories (in a wonderful wardrobe!). Some people balk at animals in clothes and I suppose for extended periods I might (although Lizzie does have a bit of a wardrobe!). But I think actor dogs get a pass! Oh! Of Course! Little House on the Prairie illustrations, Charlotte's Web, Stuart Little, the Frances series (loved "Bread and Jam for Frances")!! And "The Friendly Book"! I loved that book! Loving this post! I have a board on Pinterest filled with this kind of art. For some reason, it reminds me of my much loved Grandmother. As Mama Pea said, cozy, safe, warm and contented. Yes, I pin many of these pictures in a board I call "Just Because". 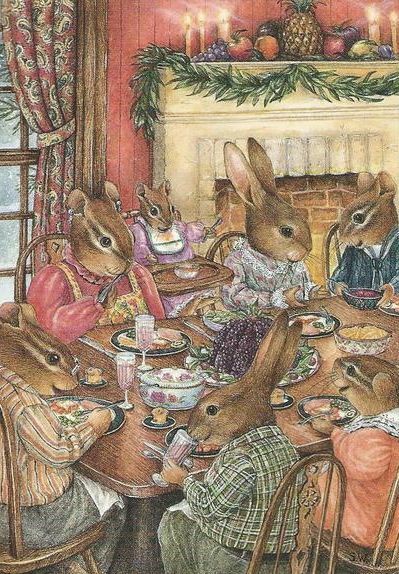 Reading this post had me thinking of Beatrix Potter. I enjoyed the illustrations in her books even though I have only seen them but never read any. I have a small painting on the bathroom wall, a female hummingbird splashing away in a tub. On the towel rack beside the tub are two towels, one monogrammed “Hers” and other “Hers too”. I love it! One of my favorite series are the Redwall books by Brian Jacques. Not a lot of illustrations but very easy to imagine the scenes, and characters. The stories center around the animals living in Redwall Abby.